We all know that life happens and change is inevitable. 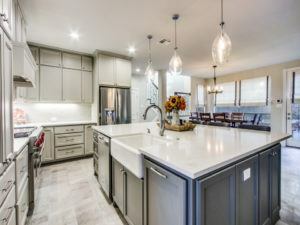 Even if you were completely in love with your kitchen when you first moved into your home, you may find it no longer suits your needs or style. In most cases, remodeling your kitchen is much more practical and cost-efficient than moving houses. But, at the same time, remodeling your kitchen is no easy feat. Planning is paramount to ensure you get what you want and need without wasting time or money along the way. Here are a few things to consider when planning your kitchen remodel. 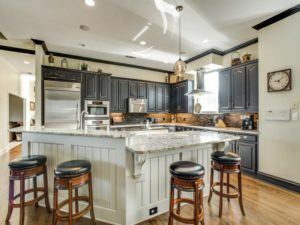 The stage of life that you and your family currently find yourselves in will have a big impact on the way you design your kitchen. The amount of traffic you expect your kitchen to see will affect not only the layout but the materials you choose as well. For example, if you’ve had kids since your last kitchen updates, you may need to make it more child-friendly this time around. If you have a busy, active family, a design with good flow and an easy-to-navigate layout could be extremely beneficial for you. You may even want to consider materials that stand up to heavy use and are easy to clean. Whatever your needs are, incorporate them into your new design to help make your kitchen as efficient and easy to use as possible. There is no question that remodeling your kitchen will take time and cause upheaval in your family’s daily routine. This is something that is extremely helpful and important to plan for ahead of time. How will you shift and accommodate not having regular access to your kitchen? Will you eat out more? Do you have the space to organize a temporary, make-shift kitchen in another part of your home? If the weather is nice, maybe you will do a lot of outdoor grilling. Talk to your project manager about deadlines so that you will have an idea of how long you can expect to be without a kitchen. Being able to see a light at the end of the tunnel and knowing that your dream kitchen is waiting for you can often make the inconvenience a lot easier to endure. Before you start your kitchen renovation, it’s important to set a budget. Figure out what you can safely and comfortably afford and plan accordingly. Then, talk to your project manager and see which projects are the best to tackle first. If you know that you only have enough money set aside for a few projects, take some time to prioritize which ones are most important to you. 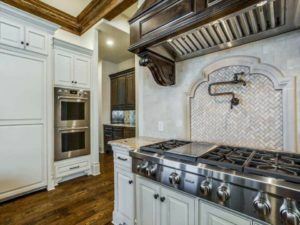 At the end of the day, you may not be able to remodel your entire kitchen, but at least the elements that are most beneficial to you will be out of the way. Download and share our free graphic to help you and your friends stay connected with this latest kitchen remodel statistic! When it comes to the design of your new kitchen space, it’s important to create a space that you love and feel comfortable being in. Here are some of the most important design elements to consider. The kitchen is the heart of the home. It can host many different activities such as food prep, dining, entertaining, and family time. 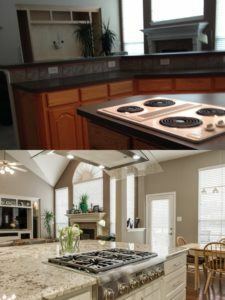 Because of this, the layout of your kitchen is one of the most essential elements to consider when planning a remodel. You want your space to be functional. So, before you start, it’s important to know and understand what kind of space you have to work with. Begin by looking at what you already have and considering the activities that space must accommodate. Ideally, when you are preparing meals, you want to be able to access everything you need — the refrigerator, stove, sink, counter space, etc. — in as few steps as possible. What would this look like in your space? How would you organize it? Would you benefit from a peninsula or an island? Can your current layout be opened up to give you more room? What part of the kitchen do you find yourself spending the most time working in? 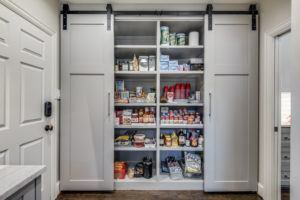 Do you need to find space to add in a pantry? Keeping your needs in mind can help you determine where to put things like cabinets, appliances, and counter space. It’s true that your needs are crucial in the planning and design of your new kitchen space. But style is likely pretty high on your list of priorities as well. After all, you could be spending a lot of your time in the kitchen, so you’ll want it to be a place that you enjoy. Which styles do you find most appealing in kitchen designs? Are you drawn to clean and modern or warm and rustic? Have you been dreaming of a farmhouse-chic kitchen or something a little more industrial? What are your favorite colors, textures and finishes? Do you prefer simple, calming neutrals or a bright, active color palette? If you aren’t sure, take some time to look at design magazines to get some ideas and inspiration. You may even want to keep a scrapbook or folder of images you like to show your designer. At DFW Improved, our professional designers are ready to walk you through our design showroom to help give you a clear vision of what your new space could look like. Once you’ve decided on the style of your new kitchen space, it’s time to take a look at materials. 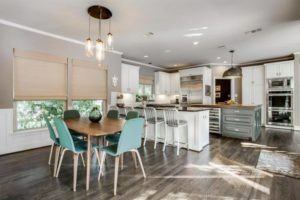 Many homeowners are willing to invest in high-end materials and hardware for a place where they know they will be spending a lot of time. Thankfully, there are a lot of materials on the market now that offer the look and feel of high-end products with less hefty price tags. For example, engineered quartz is both sturdy and attractive, and is often found at a fraction of the price of granite or marble. If an industrial feel is more your style, concrete countertops are continuing to grow in popularity. Talk to your designer about the materials that will work best in your space to ensure that you have the look you want at a price you can afford. If you’re upgrading your kitchen, you might as well take the opportunity to upgrade your appliances, too. After all, new countertops and cabinets can easily get overlooked if the appliances are still old and outdated. Choosing appliances is something that should be done as part of the planning process before the renovation begins. Not only will you need to determine which appliances you want, but you will also need to decide where to put them. This involves having accurate measurements to ensure you create enough space for each one. Do you want double ovens? A refrigerator with double doors and a pull-out freezer? A dishwasher set into your island? With new smart technology, the right appliances can also help improve the functionality of your kitchen. Imagine a coffee maker you can program remotely to operate without you. Or a refrigerator with a touch screen panel that creates and stores your shopping list for you. These days, the abundance of appliance options you have to choose from can take your kitchen to a whole new level. Deciding to remodel your kitchen is a big step, and planning your remodel is essential in ensuring that things go smoothly. As the saying goes, “Measure twice, cut once.” Taking your time to get things right during the planning process will help save you both time and money later. 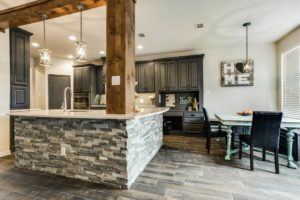 Keeping the essentials like layout, materials, appliances, and overall efficiency in mind will help you design and create the perfect kitchen for you and your family to utilize and enjoy for years to come. Do you have a home improvement project on your to-do list? Let us help you! Schedule a visit to our showroom with one of our professional designers!